WILLEMSTAD - China's Guangdong Zhenrong Energy Co will submit a plan by April to revamp a century-old oil refinery in Curaçao, as it seeks to secure a $5.5 billion project that will give China a foothold in the Caribbean's second-largest oil refinery. Guangdong Zhenrong, a commodity trader with strong backing from Beijing, signed a binding framework pact with Curaçao's government on Nov. 19, Chen Bingyan, the firm's director and chief negotiator for the venture indicated, moving past a memorandum of understanding in September. If the deal goes ahead, the Chinese firm would replace Venezuela's cash-strapped state oil firm PDVSA as operator of the 335,000 barrels per day (bpd) Isla refinery, tightening its grip on Venezuela's oil industry. China already takes about a quarter of Venezuela's exports, while its top state energy group China National Petroleum Corp has minority stakes in several joint ventures with PDVSA. Under the framework pact, Guangdong Zhenrong will provide this month a letter of guarantee from China Development Bank to finance up to 85 percent of the project, which includes building a new gas terminal and expanding oil storage. The Chinese firm will have until June to sign a new 40-year lease starting 2020 to operate the Isla refinery, although it is keen to work with PDVSA to secure crude oil for the refinery and market the fuel. "We are looking for a long-term partnership with PDVSA, in crude oil supply, fuel marketing as well as plant management," said Chen Bingyan, the firm's director and chief negotiator for the venture. Analysts said the deal could help PDVSA by keeping the refinery operating. "It may secure an asset that is important for PDVSA, particularly if Zhenrong can fund the needed upgrades to the refinery," said Robert Campbell of consultancy Energy Aspects. "On the other hand, it potentially increases China's control over the Venezuelan oil industry." Chen said the Chinese firm was ready to spend $100 million before PDVSA's lease expires in end-2019, in a bid to tackle pollution from the plant, a sore point with the local community. 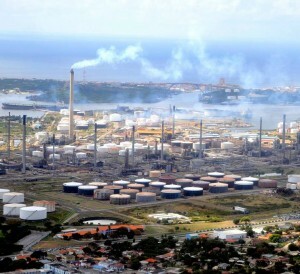 The Curaçao government turned to Guangdong Zhenrong after PDVSA struggled to maintain normal business at the plant, delaying paying for crude oil cargoes and unwilling to spend on the badly-needed plant revamp. However, the terminal attached to the refinery is highly strategic for PDVSA as it is used to blend its heavy crude with lighter oil and load supplies for shipment to Asia, as well as storage. The deal would transform Guangdong Zhenrong from a commodity trader into a full-fledged oil and gas company, boosted by an alliance with BP and its global marketing expertise. BP, one of the largest sellers of U.S. crude since a decades-long ban was lifted in late 2015, has been feeding Isla with U.S. light crude since April under a supply agreement with PDVSA. Guangdong Zhenrong, with 2014 revenues at $10 billion, has said it would lead the project and seek technical and operational support from the country's state energy giants. Longer term, Chen said, Guangdong Zhenrong could consider relocating the plant from its urban location near the capital Willemstad to Bullenbaai, with the Curaçao government possibly becoming a minority partner. The plan will be raised with Curaçao's new government, which is due to take office later this month, he said.